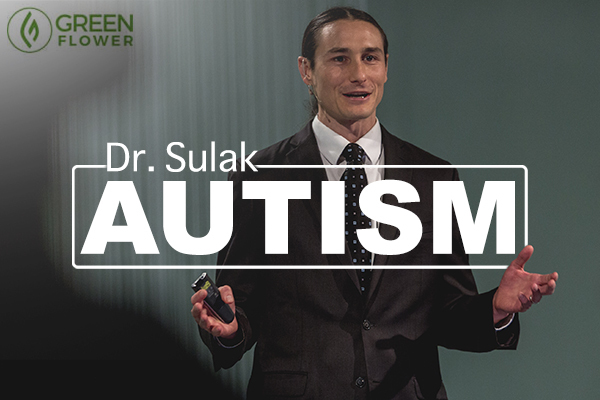 Dr. Dustin Sulak continues to break new ground in cannabis medicine. His talks on cannabis are always excellent, and he brings a lot of positive energy and credibility to cannabis medicine and education. In fact, you can now watch Dustin Sulak and 20+ other cannabis experts in the very first Cannabis Health Summit, now streaming on Green Flower Premium. Dr. Sulak shared a patient story involving autism during his CHS talk, and although autism is not a qualifying condition in Maine’s medical cannabis program, Sulak sees it a lot when working with patients who also have conditions like seizures, spasticity, chronic pain, movement disorders, etc., which do qualify. Autism is an illness that affects 1 in every 68 children, so listening to Dr. Sulak discuss what he’s observed and learned at the clinical level about cannabis and autism is an eye-opener. Green Flower: What are your thoughts on treating autism with cannabis? DS: How about the case I presented at the Cannabis Health Summit of the 12-year-old boy, who was in the ER for a week with severe self-injurious behavior before getting 5mg THC and walking out giggling a few hours later. I finally convinced the ER doc to give him 5mg dronabinol [an FDB-approved synthetic version of isolated THC) since he had previously responded well to an equivalent dose of cannabis brownies. If you'd like to hear more from Dr. Sulak and 20+ other top cannabis minds, watch the Cannabis Health Summit today! Which States Will Legalize Cannabis in 2018? What are cannabis topicals used for – and how can they benefit you? We looked into cannabis as a chronic stress reliever and this is what we found.